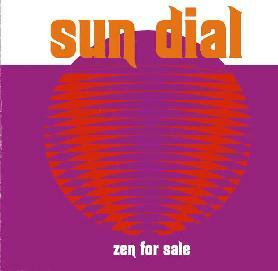 Sundial - "Zen for Sale"
It has been a very long time since Sundial released a studio album or any album for that matter. Not that Gary Ramon has not been busy. He has produced loads of bands and played with Current 93. But in 2002 he pulled together some of his musician friends and they made an incredible CD. The CD begins with the excellent psychedelic 60's inspired "You're Still Wondering". This song could have been recorded on the One Way Out or Reflector sessions, bringing back that feel. Don't think that Gary is just treading the same ground he did before. "Open Your Eyes" has a very rough and raw guitar and production sound and a great piercing guitar. "Believe In The Spaceman" is a 6 minute track with a great organ and space wah guitar groove. Take us away Gary! "Tumbling Down" is a nice Syd Barrett like acoustic number. "Acid Test" is next and is about 2 minutes of quite strange stuff. A very cool trip for headphones and a great mix. "Supernatural Man" has a slow rumbling bass that layers of acoustic guitar and organ are layered over the top. The space wah solo is brilliant phased. "Out Of Space And Out Of Time" is the same version that appeared on the single reviewed in Aural Innovations (March 2003). A cool 60's psych-pop song. "Blue Sugar" is a 6 minute psychedelic journey. The CD closes with "Reflections", another very 60's inspired track. This has also been released on a limited edition vinyl version. The web site does exist but none of the links has any information at this time. All dead ends. For more information you can visit the Acme Records web site at: http://www.acmerecords.co.uk.